Enter in your mobile phone number or e-mail address and we will notify you when City Nav Italy / Greece Maps MicroSD is back in stock. City Navigator Italy / Greece NT provides detailed road maps and points of interest for your Garmin device, so you can navigate turn by turn to the destination of your choice. This map is provided on microSD card (with SD sleeve) so just plug it into your compatible Garmin GPS and you're ready to navigate Italy, Vatican City State, San Marino and Greece! 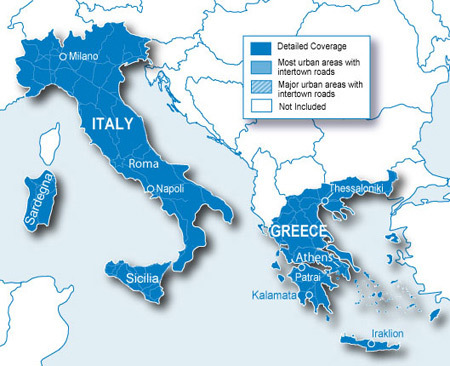 Coverage includes Italy, Vatican City State, San Marino and Greece. Great package overall, and micro SD was easy to add to/set up in my Aussie maps Nuvi 55 unit. Cane be very slow to locate a route immediately after being turned on. Our handset is 6 years old, we wonder if this is the problem, we need to update? I used the map when travelling across Greece and on the Ionian Islands. Many times the coordinates function was wrong, streets didn't have names and I had to use a paper map to check I was going the right way! !